Perhaps science fiction fandom leaves you agog with indifference and you read this column only because you are compelled to by the sheer literary brilliance of my writing, or because you have inadvertently turned over two pages at once. Nevertheless you may have wondered, as you fumble hastily back to your proper place, what on earth people find to write about in all these fan magazines I keep talking about. Well, of course most of their contents are ephemeral stuff, but usually there is some controversy of lasting interest raging through the whole field, with skirmishes being fought out in fan magazines all over the world. Some years back, for instance, there was a battle of the so-called 'Shaver Mystery' ; a series of stories based on a lunatic mish-mosh of weird ideas, such as that mankind was being persecuted by an evil race called "deroes" who lived in caves under the earth. The editor claimed that they were true and built up a large circulation among the crackpot fringe. Science fiction fandom proper was of course furious, but the argument as to the best way of dealing with this menace to the good name of science fiction caused disturbances which reverberate to this day. Then somewhat later there was the dianetics battle, as fandom . . . hostile, sympathetic or just bored stiff . . . witnessed or assisted L. Ron Hubbard's eventful progress from pulp to pulpit. The current controversy is "Has Science Fiction Lost Its Sense of Wonder?" and it's almost entirely the work of one man. New York fan Sam Moskowitz has been asking this question so loudly and so long that by now practically everyone in fandom is trying to answer it, if only to keep him quiet. Sam's oft-reiterated view is that in the Twenties and Thirties science fiction had a simple and sincere appeal to the imagination which the clever literary-psychological stories of today have lost. They have, as it were, thrown out the baby of childlike wonder with the bathos water of bad writing. The usual answer, given most trenchantly by Damon Knight (whose brilliant reviews have now been anthologised in "In Search of Wonder," Advent, Chicago. $4.00) is, simply, that Sam only thought those old stories were good because he was young when he read them. Another answer is that wonder isn't so easy to excite these days, with fantastic things in every morning's newspaper. This point of view was put with devastating effect in a story by Randy Garrett in the American fanmag "Inside." Purporting to be the first instalment of an old-type serial, it merely described the journey of the hero, Sam, to his office in the morning: but everything—the car, the subway train, etc.—was described in awed tones as a superscientific marvel, in a hilarious burlesque of the prolix style of the old masters. For a long time I was pretty sure myself that the Knight school had the right answer: that was because I'd recently reread all those great stories ofthe Thirties I'd last read as a schoolboy. They were all tripe, every last dull one of them. I could work up not the slightest enthusiasm for the Cummings and goings of the cardboard heroes, nor even the blowing of planets into E.E. Smithereens. It was quite clear to me that no sf worth reading had been written in magazines prior to August, 1939. But then lately I've begun to realise that I don't care much for most present-day sf either. No doubt my palate is jaded, but I'm not sure that that's a sufficient answer. The question is, it seems to me, whether the sf of today is capable of putting stars in the eyes of the modern youngster, as the sf of the Thirties did in mine. If it's not, heaven help us all. Us old stagers will keep ploughing through the contemporary output looking for the unforgettable thrill we once knew, but there'll be no such lure for the new generation. It seems to me that most of today's high grade work is not science fiction in the old wondrous sense at all, but merely human interest fiction with a scientifictional background. Better written, of course, but the authors are so determined to be so sophisticated that they deliberately make the marvellous commonplace, as if space and the future were all old hat. Whereas I devoutly believe that not one author has so far even touched the depth of emotions that will be felt by the first man to leave the Earth's atmosphere. Could we not have more authors with stars in their eyes and fires in their bellies and an urge to the thrill of discovery? Meuh No. 2. Jean Linard, 24 Rue Petit, Vesoul, Hte. Sne, France. 1/6. This huge and wonderful pot-pourri is 100 pages long and is published by a Frenchman who started to learn English, by reading sf, only about a year ago. In its fantastic conglomeration of contents the principal item is a 26-page report on the recent New York Convention by Ron Ellik, who hitch-hiked to it all the way from Los Angeles. Pungently written, the report is entitled "You Can't Sit Here," the villain of the piece being the Convention Chairman, whose allegedly officious restrictions infuriated Ellik. Naturally, after thumbing his way some 4,000 miles Ellik must have felt himself morally entitled to sit down anywhere he chose. Eye No... 6, Joy & Vince Clarke, 7 Inchmery Road, Cat-ford, London, S.E.6. 1/-. Most interesting items this time are a long editorial by Joy and some very fine reviews by Vince. 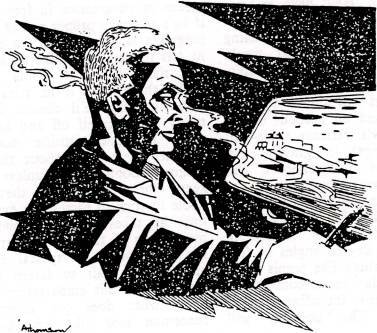 There is also a brilliant criticism in cartoon form by Arthur Thomson, of the film "Conquest of Space."